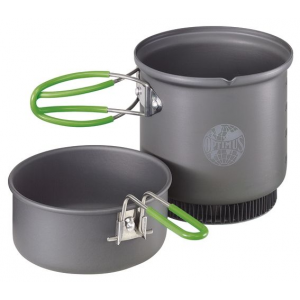 I was able to heat water to a boil in about 1/2 the time as when I used my GSI Dualist pot. Obviously the heat exchanger bottom really works. I have carried the GSI Dualist for years but really did not need the bows, cup, etc. The first time out with the Optimus Terra HE I liked it. I just finished a 3-day section hike on the AT with my grandson and we had plenty of hot water for both of us for every meal of Mountain House. The quick boil times, even with temps in the 20's save a lot of fuel. The lid fits snugly enough to hold everything inside for packing. 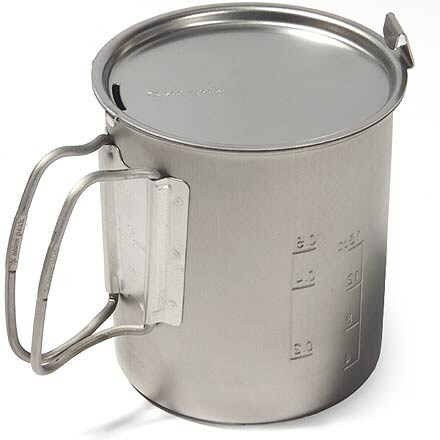 The coated handles on the pot and lid never got hot. Needless to say, I am very happy with this cookset. 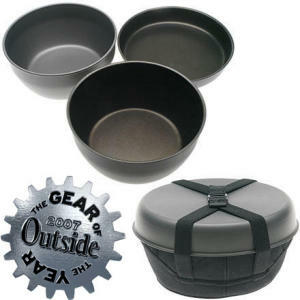 is the pot with the heat exchanger designed specifically for an Optimus stove or can it be used with any stove? Efficient boiler with room for a stove, even a 43-year-old stove. After resurrecting a 43-year-old SVEA 123 for my winter forays into the wilderness, I started looking for a pot that would be big enough to hold it. I'm always looking for ways to lighten and compact my gear. I have a tea kettle, that is really the only cookware I've carried for years; but having that and the SVEA takes up too much space in the food bag. Enter the Terra Weekend HE. I first saw this on a youtube video, purchased one, and the stove fits perfectly inside. The heat exchanger really does make a difference in boil time (= lower fuel usage), just over a minute faster than using one without it. Hard Anodized aluminum. 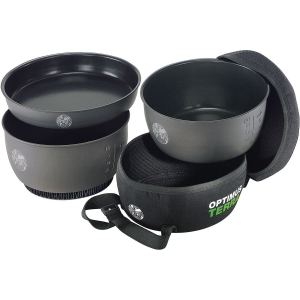 The sides of the pot are marked in ml, oz, and cups, making measuring easy. Holds 0.95L — about a quart full. Weighs about 9.5 oz. by my scale. Handles are very stable. The lid is advertised as a fry pan. I can't imagine frying anything in something that small. I use it as a soup bowl. 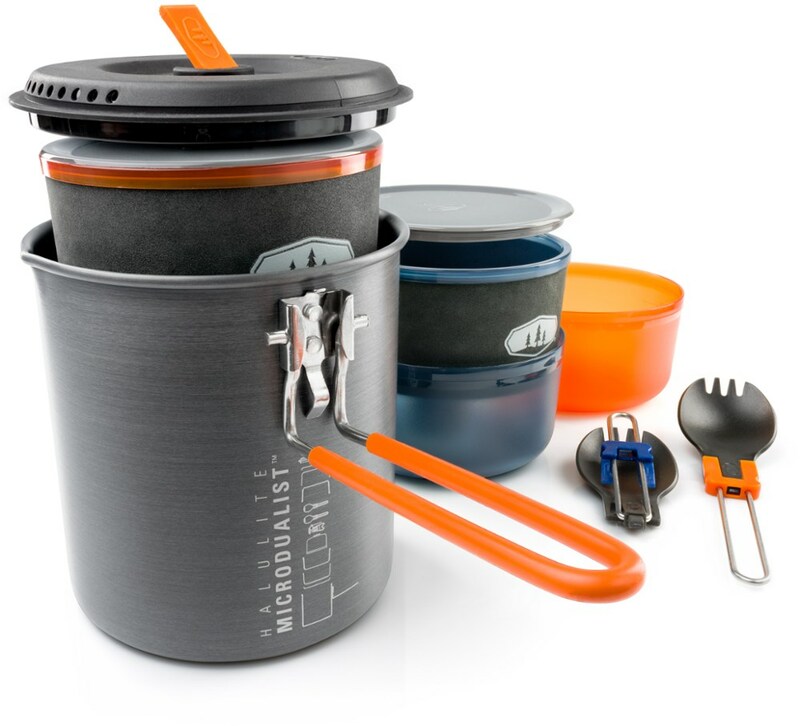 While hiking, I carry my lunch (which always includes some kind of noodle or instant soup) in the stove bag. I like to stop at lunchtime (or the best view so far) fire up the stove and have a cup of soup and probably some coffee before continuing my hike. I made a cozy for it out of some blue closed cell sleeping pad material, and some gorilla tape. The lid fits in there nice and snug, with a slot cut in the foam for the handle. Keeps my soup nice and hot until it's gone. 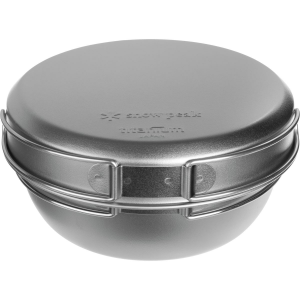 I've used the lid to reheat cooled coffee/tea on campfire coals, but would not use the pot with the heat exchanger for that. It's designed exclusively for stove use. It comes with a mesh bag to keep everything together. As for the stove, I wrap it in a piece of cloth (my kitchen towel actually) before inserting it into the pot so it won't rattle around inside. 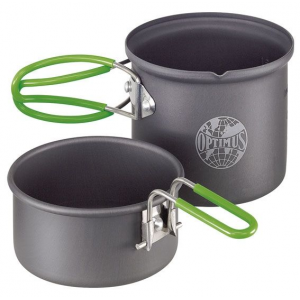 If you're smarter than I am, you can get an Optimus Crux (or similar stove) with a gas cartridge, folding spoon and a couple of other items in there. Lighter too. It's just that my SVEA has cooked hundreds of meals over the years, and it seems to really like its new home. Who am I to go breaking up a marriage like that? See ya on the trail somewhere. Nice review, telebruce! Thanks for taking the time to share it. Got any pictures of your cookset and stove setup you'd be willing to show others in your review?